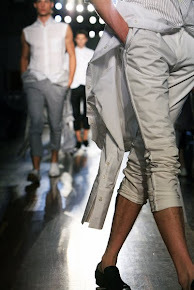 Day seven of Mercedes-Benz FashionWeek Amsterdam started early and lasted until the early morning. Seven catwalk shows at three venues, a ‘10 Days Downtown’ event in the Van Gogh Museum and two exciting after-parties, all in their own way, revolved around the creativity of the artist. On the catwalk in De Gashouder, no less than three shows were on the programmed yesterday. Atelier MariaLux surprised everyone by rotating the catwalk ninety degrees, getting the models to form a band and give a show to the rhythm and the choreography of a musical performance. The men’s fashion from Francisco Benthum presented by Monte Scroppino, and Jan Boelo’s catwalk show, made possible by smart, also drew a lot of attention. In the Vodafone Firsts Fashion LAB in the afternoon, the spotlight was on the duo-show by Franzel Amsterdam and Duran Lantink (Fashion LAB). It was followed later by two Fashion LAB PRO shows from David Laport and Jef Montes, names that have already been mentioned a lot in the run-up to fashion week: the former mainly because of his spatial approach, Montes for his innovative use of materials and the creation of its own fabrics. Kathryn Milan showed her A/W '14 collection in the beautiful old Palace of Justice on the Prinsengracht. A few kilometers away, the monthly Friday night at the Van Gogh Museum was dedicated to the inspiration fashion designers Mattijs van Bergen en Borre Akkersdijk derive from the work of Vincent van Gogh. So the creativity of the artist was again the link between the cultural gems of the capital and Mercedes-Benz FashionWeek Amsterdam. On the Westergasterrein the evening continued with exuberant partying at two after-parties. In Westerliefde the entertainment channel E! organised a VIP party and in the Westerunie Ryan Marciano, Olivier Heldens, Shermanology and Dubvision were the DJs at the decks for John Boelo’s party.